The book chronicles the life of Oscar de León, an overweight Dominican boy growing up in Paterson, New Jersey, who is obsessed with science fiction and fantasy novels and with falling in love, as well as with the curse that has plagued his family for generations. The middle sections of the novel center on the lives of Oscar’s runaway sister, Lola; his mother, Hypatia Belicia Cabral; and his grandfather, Abelard. Rife with footnotes, science fiction and fantasy references, comic book analogies, and various Spanish dialects, the novel is also a meditation on story-telling, the Dominican diaspora and identity, masculinity, and oppression. Most of the story is told by an apparently omniscient narrator who is eventually revealed to be Yunior de Las Casas, a college roommate of Oscar’s who dated Lola. Yunior also appears in many of Díaz’s short stories and is often seen as an alter ego of the author. Pros: For me, this book somehow manages to embody that elusive “magical realism” genre that so many authors have attempted to capture since Gabriel Garcia Marquez coined the category with “One Hundred Years of Solitude.” The characters are real and flawed and complex, the history is rich, and the story sucked me in immediately. This is honestly one of the best books I have read in the past few years. I have given it as a gift to multiple people, and they have had nothing but good things to say about it. Cons: Don’t buy the Kindle edition. You need the hard-copy with the footnotes right on the page for you to read right as they come up in the book. There are a lot of footnotes, and they’re 100% needed to fully enjoy/understand the book. 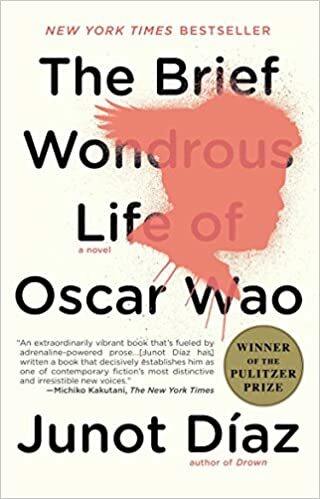 “The Brief and Wondrous life of Oscar Wao” by Junot Diaz is a heartfelt tale of the life of a Dominican family and their tale. Within the text Diaz brings Dominican history and the struggle of a society affected by an oppressive power, comics, sci-fi, Dominican slang that is one of a kind, and footnotes that give you an honest definition, but also make you laugh from time to time. From young to old we view the lives of five characters that all parallel with each other, but we do have a main marginalized character that brings the whole book together. We are greeted by a boy named Oscar, who is raised in Paterson, New jersey, but has the background of a “Tigre”, which could only mean he’s Dominican. He is an overweight teenage nerd with a passion for sci-fi and japanese animation. He has ambitions to write sci-fi novels and get a girlfriend. Although, will this really ever happen? When Oscar falls deep he falls deep when it comes to the girl of his dreams, but by the looks of it every girl is the girl of his dreams when it comes to it. Throughout Oscars struggles we learn that he has a sister named Lola, she is a strong character that goes through a lot of self growth on her own. She is also difficult with her mother as much as her mother has been difficult with her. Although we learn why when we get to see the background of their mother Belli and a family member of theirs. Most of the story is told in third person, but who is the narrator? We don’t really know till deep into the book. The book itself reads like one speaks, but some of the lines are so thought provoking that it took me a while to comprehend what the author was trying to say. It was also amazing to be able to relate to the book and what was happening with some of the characters, even feel what they were feeling. Overall I loved the book, personally it gave me more insight into my own culture and I had fun reading about a little bit of the history of the Dominican Republic through someone else’s eyes. One thing to remember is to not overlook the footnotes because they give a lot of background as to what the author is trying to convey and they can be very fun and uplifting, they are nothing like regular footnotes. More than the story of Oscar –an obese, bullied, comic book-loving, fantasy role-playing nerd on a desperate mission to lose his virginity– this is the story of a Dominican family’s fukú: a potent curse said to have been cast on Oscar’s grandfather Abelard by the Dominican dictator himself, Rafael Leónidas Trujillo. A fukú may affect generations, until someone along the line manages to find the right zafa to break the spell. In a combination of Spanglish, slang, and the occasional made-up expression, Junot Díaz effectively captures the spirit and evolved identity of a transplanted Latin American family onto U.S. culture. It touches upon the struggle of a society affected by oppressive power, and the resilience and determination needed in their diaspora. As a native Hispanic, I wonder if and how non-Spanish speakers get to fully understand this book, because it’s written not only in Spanish but in Spanish (untranslateable) slang. Also, as a native Hispanic, I was annoyed at the multiple grammatical and spelling errors in Spanish. Couldn’t Diaz have found a bilingual editor? The book’s chapters alternatively tell the story of Oscar and his immediate family members. Narrated by Yunior, Lola’s on-again, off-again boyfriend, we learn of the De León clan’s woes and how fukú, inevitably, catches up with Oscar. From the title we are aware that Oscar will die, but that news does not lessen our sorrow because by then we are despairingly rooting for his success. Oscar’s unquenchable thirst for love is heart-wrenching because it is snubbed by every female he encounters. “His affection –that gravitational mass of love, fear, longing, desire, and lust that he directed at any and every girl in the vicinity without regard to looks, age, or availability– broke his heart [and ours] each and every day”. His family members and their struggles also break our hearts in their own struggles to survive their personal hell. As for the dose of Dominican history included in the book, I am so curious about Trujillo now that I will follow with Julia Alvarez’s “In the time of the butterflies” and Mario Vargas Llosa’s “La fiesta del chivo”. Intense!